Diabetes is a growing problem in Arkansas. The Center for Disease Control rates Arkansas seventh in the nation in regard to cases of reported adult diabetes and estimates the number of cases of adult diabetes in Arkansas will be close to 400,00 within the next 15 years. Lecture and Q&A series on how to curb the rising rates of diabetes in Arkansas. These lecture series will be held in selected communities across the state. Hope is one of these communities. 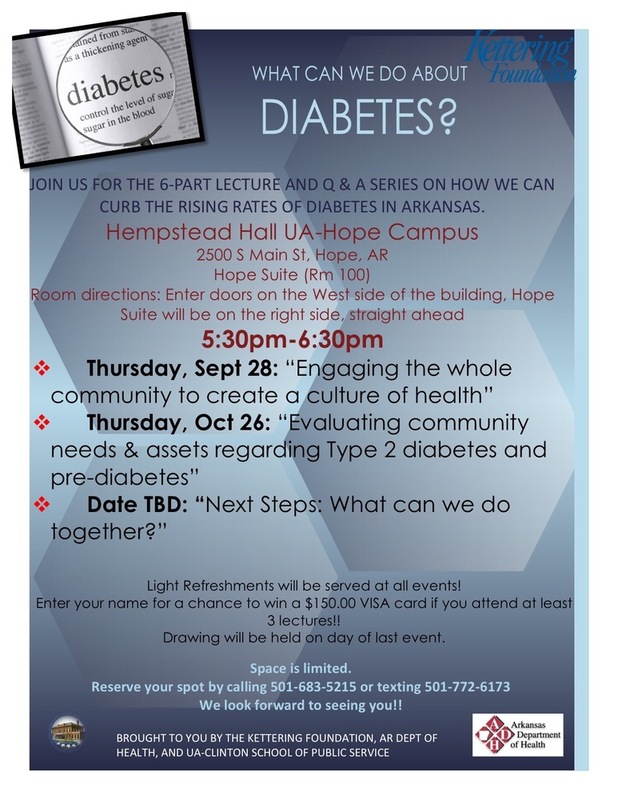 The fourth lecture in the series Hope will be held Thursday, September 28 from 5:30-6:30PM at Hempstead Hall on the UA-Hope campus, 2500 South Main Street. Detri Brech, Certified Diabetes Educator, will give a short talk entitled, “How Can We Work Together to Create a Healthy Community?” and then take questions from participants. Light refreshments will be served. Participants will also have a chance to win a $150.00 VISA card if they attend at least three of the events in Hope. The event on September 28th will be the last chance for new participants to register for the drawing. The drawing will be held on the day of the last event. Space is limited, so please call or text Christina Standerfer, event coordinator, 501-772-6173 to reserve your space. About the Kettering Foundation: Charles F. Kettering, inventor of the electric automobile starter, created the Kettering Foundation in 1927. The Kettering Foundation is a nonprofit operating foundation rooted in the American tradition of cooperative research. Kettering’s research is distinctive because it is conducted from the perspective of citizens and focuses on what people can do collectively to address problems affecting their lives and their communities.